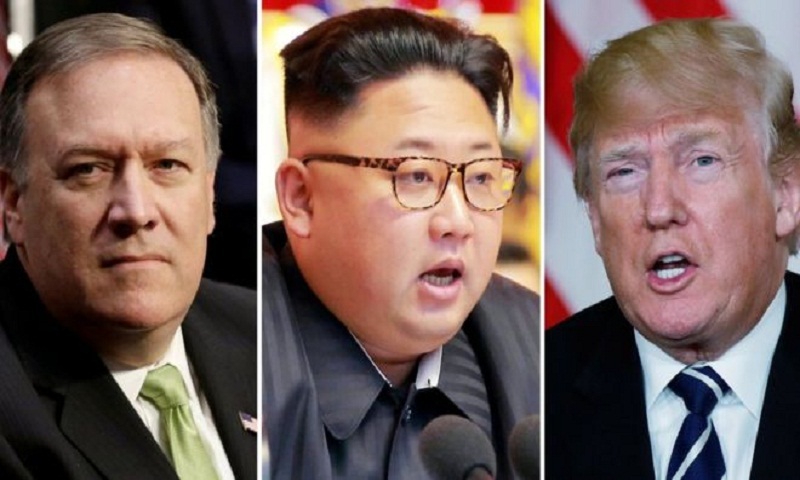 The meeting to prepare for direct talks between US President Donald Trump and Mr Kim took place over Easter weekend, unnamed officials told the Washington Post and Reuters. Earlier Mr Trump acknowledged the US had held direct talks at high levels. He was speaking as he hosted Japanese Prime Minister Shinzo Abe in Florida. "We have had direct talks at... extremely high levels," he said, adding that five locations were being considered for the Kim Jong-un meeting. He also said he gave his blessing for talks between South and North to discuss a peace treaty to formally end the 1950-1953 Korean War. The news that Donald Trump's nominee for US Secretary of State had travelled to North Korea for a clandestine meeting with Mr Kim was first reported by The Washington Post newspaper. According to the paper, the meeting took place soon after Mr Pompeo was nominated as secretary of state and is attributed to two anonymous sources "with direct knowledge of the trip". Mr Pompeo's trip was the highest level meeting with a North Korean leader since 2000 when then-Secretary of State Madeleine Albright met with Kim Jong-il, the father of the current leader, in Pyongyang.